My intent in starting this blog was to share my culinary adventures in and around Stuttgart since I enjoy food and make an effort to find good dining experiences. However, my husband and I spend most of the work week cooking and, to some extent, trying to imitate many of the delicious meals that we've eaten here and abroad. With this in mind, I thought it might be useful to write a post on shopping for groceries in case you, like me, are an expat in Stuttgart looking for the right ingredient for your favorite meals. Yes, that's our grocery store at the bottom of the apartment building that looks like a castle. Size and Brand: There are several different grocery stores in Stuttgart, ranging from budget stores like Lidl to more moderately priced stores like EDEKA and Rewe. In addition, each one has their own store-brand of goods like yogurts and chips in addition to more expensive name-brands. I find grocery stores in the city to be much smaller on average than the larger ones in the suburbs and in newer shopping plazas. While this is very different from the football-field sized grocery stores in the States, we shop at one of the smaller EDEKAs and find that it has most everything we need for day-to-day groceries. Plus, shopping trips take way less time when you're not roaming through dozens of aisles. Shopping Carts: No matter where you go, make sure you bring a 50-cent or 1€ coin to use the shopping carts. You'll need to put the coin in the handle to release the lock keeping it attached to the other carts in the store, but you'll get your coin back once you return the cart and replace the lock. (I wish American grocery stores would adopt this; there'd be fewer abandoned carts in the parking lots, I'm sure!) The smaller shopping baskets are free. Bread: While our grocery store does have a small bread aisle inside with American-style burger buns, wraps, and gluten-free breads, we usually stick to the K&U Bäckerei just outside the store for all our rolls and loaves. They have so much more than American white bread and it's all so much fresher and cheaper (think 1-2€ for most loaves). Even the loaves of white "toast bread" that they make and slice fresh for you taste better than American Wonder bread. I should note that there's no such thing as "wheat bread" here as most of the German bread is dark. I've mostly used trial and error while ordering, but I also find the bakers really helpful, even when there's a line, and more than willing to give you only half of the large loaves if that's all you can eat. Produce: Another feature of our grocery store that I've found different from American stores is that produce is mostly seasonal and local, so no berries in January. You'll also see a three-digit number next to the price so you can pay for the exact produce that you buy. Once you've bagged your fruits or veggies, simply put the bag on one of the scales and punch in the number to receive a sticker with a price and barcode. I didn't know this when we started shopping at our EDEKA, and had to work through some awkward conversations with the cashiers at the registers and some angry glares from the customers held up behind me. 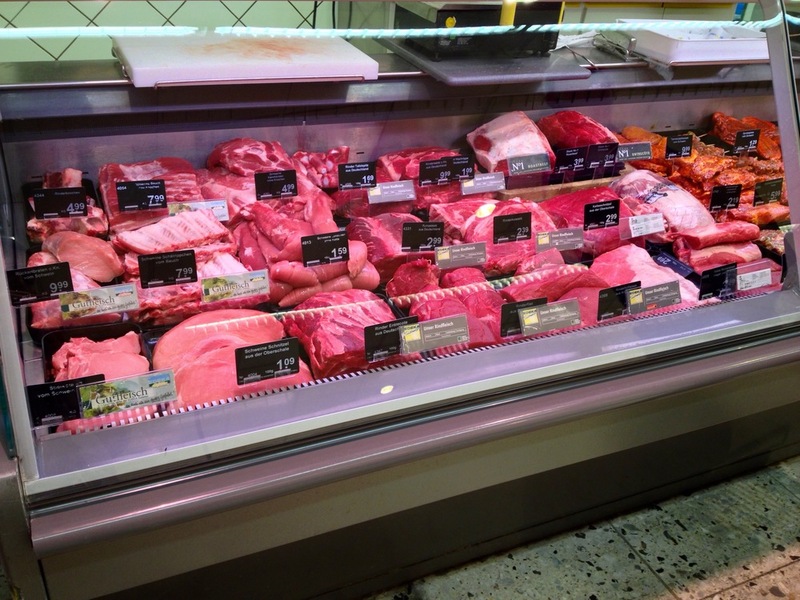 That said, Rewe doesn't seem to require this and some of the other high-end grocery stores will do it for you. Still, it's important to check. 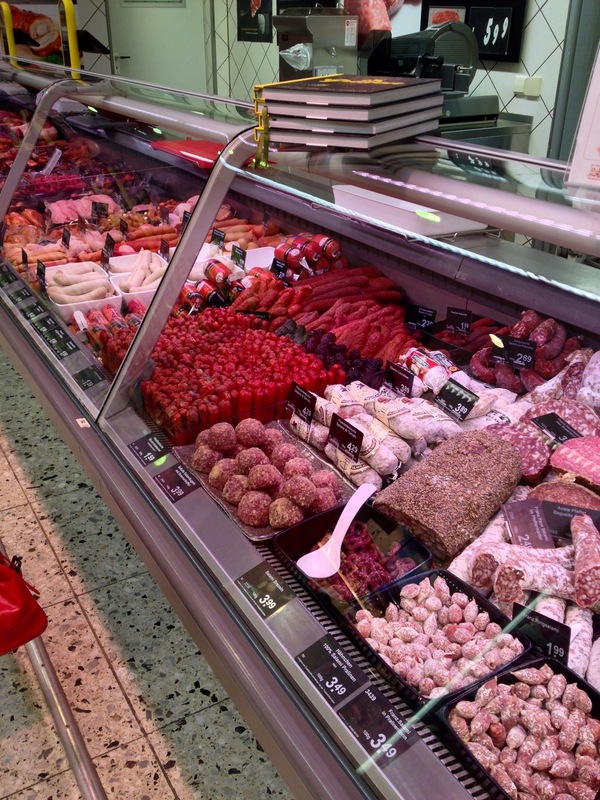 Groceries: Being so far in-land, the seafood counter is a bit smaller than what we were used to on the East Coast, but the butcher is huge with more kinds of sausages than you can count on your fingers and toes! I also really like that the butcher will often cut off steaks and grind up meat fresh for us, since pre-packaged meats aren't as popular here. Also, as with most European grocery stores, milk and eggs can be found out on the shelves rather than in the refrigerated section, and last much longer than in the US. And unlike Virginia grocery stores that only sell wine and Maryland grocery stores that don't sell alcohol, you can find both wine and liquor in German stores. Bottles: Whatever drink you purchase in a bottle, no matter if it's plastic or glass, you'll have to pay a few cents, called a pfand, to take it home. Then, when you've had your drink, you can bring the bottle back to the store and put it through one of their bottle return machines to get your money back. Note that you'll get a slip of paper with the money owed to you, and when you go up to the cashier, you can either put the balance towards your groceries or just get cash back. The system is really great for recycling, and I find the grocery store to be really lenient about letting you take home the plastic bins that the bottled beer and water come in if you're buying a lot (with the assumption that you'll bring it back, of course). And what about the glass jars for pickles, jams, and oils that you buy? On every other street corner you'll find glass return bins for white, brown, and green glass so you can do your part and recycle. Recycling: On that note, Stuttgart is fantastic about recycling. Not only can you recycle your bottles and glass, but most homes and apartments come with two bins: one green one for paper and one black one for burnable trash. Some even come with a third brown bin for compostable waste. You should also make sure to pick up your gelbsäcke (yellow bags) at the grocery store. These free plastic bags are for storing your recyclable plastic containers, like those yogurt cups and detergent jugs. The bags usually get picked up from the curb once a week on a different day depending on which street you live on. Bags: Because Germany is so good about recycling, I find the grocery stores try to dissuade you from using their bags by charging you for plastic or paper bags. I have a few reusable shopping bags, including a small pop-out bag, that I always bring with me for this reason. Also note that unlike the States, you'll be expected to bag your own groceries. Pets: Although dogs are allowed in restaurants, on the metro, and in most shops and businesses, they are not allowed in the grocery store. This does not appear to be a problem for most German dogs (and Leo, too) who know how to wait patiently outside for their owners. Hours: And remember, grocery stores, along with retail stores, are not open on Sunday or holidays, so plan your shopping accordingly! For absolute emergencies, some (but not all) gas stations will have the basics like sugar, flour, and milk. Even though our local grocery store has everything we need for day-to-day cooking, it can be tricky to find certain ingredients most often found in international cuisines. Yes, our grocery store has an "international section", but it's pretty limited to instant noodles and jarred salsa. That's why I sometimes have to go to a few different stores to get ingredients when I'm making a special dish. Usually I can get away with just going to Galeria Kaufhof next to the Hauptbahnhof for any extras that I need. They have a rather large grocery store on the bottom floor with some hard-to-find items, like Arm & Hammer baking soda, peanut butter, brown sugar, real vanilla extract, hot sauces, canned pumpkin, boxed brownie and cake mixes, and imported beers. They also have a much larger wine and liquor section if you're looking for something special. Until recently I was also going to Feinkost Böhm along the Königstraße to get corn tortillas, but Galeria Kaufhof has since started stocking them (called "Mexican tortillas"). Another ingredient that's been hard to find is cilantro (called Koriander here). Rewe, Edeka, and Galeria Kaufhof sometimes have it in the summer, but they run out often and so I never bother relying on them to have it. I can always find large bundles for a couple of euros at the Trieu Asia Shop beneath the Rathaus. They also generally have all the sauces and different kinds of noodles that I need for my Japanese and Chinese dishes, as well as a large selection of Indian and other South-East Asian spices for much cheaper than at the grocery store. There's a pretty good produce stand next door for any other fruits or vegetables you might need for your meal, some of which I've seen for cheaper there than at the big-name grocery stores. The Markthalle is another great location for international goods. While produce in the grocery stores is seasonal, you can find most fruits and vegetables year round at the Markthalle -- for a price, of course. I've found it a great place to get both fresh and dried herbs for less than at the grocery store, as well as meats, cheeses, and fresh pastas from Germany's neighbors. It's the best place to get Spanish chorizo, canned chipotles in adobo, and fresh tortilla chips, as well as Hungarian kielbasa and homemade Italian ravioli. If you're looking specifically for typical British foods like malt vinegar, India Pale Ale, Cadbury's chocolate, and Walker's potato chips then the Piccadilly English Shop is the place to go. They have a handful of rows with basic grocery items, in addition to a number of English books, cards, and other kitschy goods from the UK (think a teapot with the royal family on it). In addition, I'll often stop by Stuttgart's weekly farmer's market on Saturday morning if I'm looking for a specific kind of seasonal produce, local jams or honey, and sometimes wine. For any special wine that we need, we'll usually go to our favorite Mövenpick Weinkeller. Although we use the bakery at our local grocery store for most breads and rolls, we really like the pretzels and desserts at our nearby Bäckerei Frank. And finally, on one very special occasions like Thanksgiving and Christmas, we've been able to call ahead and order large, fresh turkeys and roasts at the very friendly Metzgerei Wagner in Stuttgart-West. When all else fails, there's always the internet! Although Germany's branch of Amazon has some groceries (called Lebensmittel), they tend to be pricey and take a while to ship. We've had more success with specialty sites like Americandy for (you guessed it!) candy and Bier Deluxe for both American and Belgian beers. I've also got my eye on two other sites to try: AmericanFood4U and AmericanSoda. They both sell Libby's canned pumpkin, which can be hard to find even at Galeria Kaufhof in the fall, and Nestlé Toll House chocolate chips, which don't exist in German grocery stores at all from what I've seen. Do you still have questions or other tips for expats moving to Germany? Leave your comments below!